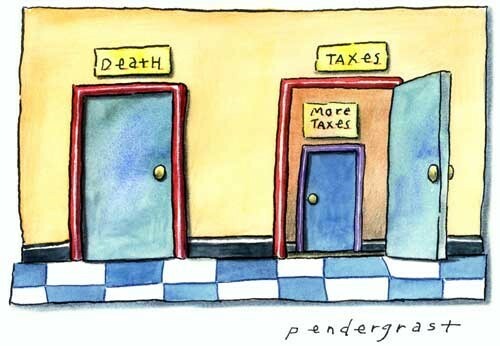 Benjamin Franklin said “In this World nothing can be said to be certain, except death & taxes”. Damn, well death is something we cannot do anything about but can we stop taxes?? So what is tax, it is a compulsory contribution to state or local body revenue, levied by the government or council on workers’ income and business profits, or added to the cost of some goods, services, and transactions. Ok, the key word here is compulsory in as much as you don’t have a choice as to whether you pay tax or not. Yes you can minimise your tax through various means but at the end of the day you still have to pay some tax, right? Sure, sure, sure tax enables the Government to provide roads, hospitals & social support benefits etc etc but that is not what we are discussing here so focus people. So tax is compulsory which means that for a certain part of your working week you are working for somebody else, the Government (state or local), with no choice and for no monetary reward. This would therefore mean that you are in involuntary servitude. So when it comes to taxation are we able to change that status or condition, are we able to decide that in fact no, thank you very much for the kind offer but I would not like to pay any tax. Tax is even hidden in product or services pricing so even if you live a subsistence lifestyle the minute you buy goods or services you are paying that tax. So therefore I do not believe that we are, even if you are on a benefit you are still taxed on that benefit or in the goods or services you buy or use. So, as we are therefore not able to change that status or condition the Crimes Act swings into force and the Government is therefore liable to imprisonment for a term not exceeding 14 years for Dealing in Slaves. In a nutshell slavery is illegal in New Zealand, therefore taxation is illegal. This is a light hearted post for entertainment purposes only and is not intended or put forward as personal or professional opinion.